Those who have walked through Clapham Junction today, most of which has been closed off, will have seen at least 3-500 people called together mostly via twitter, armed with brooms, dustpans, bin bags and more, ready to take their community's streets back and clean them up after the most disgraceful scenes of mob violence and looting ever witnessed by Battersea. 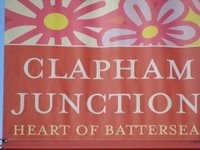 If ever there was a sign that Battersea has great spirit and a fantastic sense of community, this was it. - luckily this story can be happily corrected: after concerted discussions with the Police, local Battersea MP Jane Ellison and Council Leader Ravi Govindia managed to open up the first of the streets around Clapham Junction for the "Battersea Broom Army" to get to work on cleaning up. They have now cleared the entirety of St John's Road.